After a month of being tucked away in Danneel's garage, we attempted to get our broken car home. We were going to rent a U-Haul towing dolly and pull it home with our Dakota, but apparently the towing vehicle has to be at least 700 lbs. more than the towee vehicle. 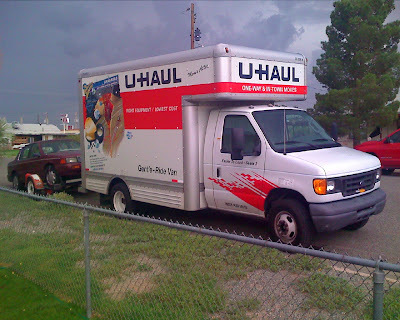 Sooooo after we got to Mesa, we had to rent a U-Haul truck as well. The fun part was getting to Mesa. Since we were going to be towing our car home with a truck we were picking up in Mesa we had to get there with help. We got help... we did a relay hitch a ride from Lordsburg to Mesa. Mom and Corky took us on the first leg to Pima where we met Timile for the second leg, who took us to Globe where we met Danneel for the third leg, who took us the rest of the way into Mesa. THANKS EVERYBODY! Patti had a Dr. appointment with Dr. Simon in Phoenix so we figured we would kill two bird with one stone. We were on our way to Dr Simon's at 10AM when we got the call that he had emergency surgery and could not meet with us at the designated time. However, since we were from way out of town he arranged to see us when he was done at 2PM. 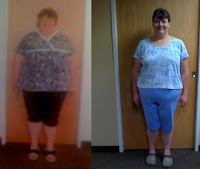 Patti got to weigh in and has officially lost 140 lbs. since her surgery one year ago.